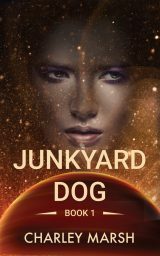 The Junkyard Dog serial series in the novella format brings back fun action and adventure science fiction. Major Margarita King, the only female pilot in the elite Red Barons, worked hard to hold her position at the top of her squad—until the day someone sabotaged her ship and sent her on a mission to die. And so begins the adventures of Margarita King—smart and savvy defender of the underdog–while she gathers her unusual crew and finally heads back to where it all began to face an unknown enemy. Rita King loves being a galaxy cop. Loves the feel of deep space between the stars. Loves her ship. Tough, smart, and honest to the core, Rita believes in the laws she swore to uphold. Everything changes for Rita the day someone she trusts sends her out to die. 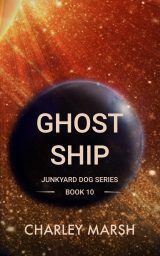 Book One of the Junkyard Dog adventure series introduces Major Rita King with a smart and edgy tale of betrayal in space. The planet Harmos. Old Earth blues and jazz clubs, fresh seafood, and best of all, Rose’s Bath House. The next day Rose disappears. A Weegan never turns away work. Rita King heads to Weegan, home of the best mechanics in the galaxy, but they refuse to let her land. Rita senses trouble and a mystery that begs to be solved. She can’t resist. A gripping tale of high stakes on a distant planet in the galaxy, Deadly Cargo delivers another adventure with space pilot Rita King. Ruby City hides secrets thousands of years old. Major Rita King takes her newest crew member to visit the famed Ruby City where they find far more than Rita bargained for. 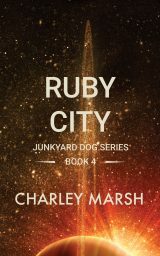 Book Four of the Junkyard Dog series, Ruby City once again calls on Rita King’s brains and courage in an unexpected and richly detailed world. Sometimes even the simplest of tasks go wrong. Important business takes space pilot Rita King and her companions to the galaxy’s Central Bank on ZetiTau. ZetiTau: an efficient, strictly-controlled planet. Customers show up. Conduct their business. Spend a few credits. Leave. Exactly the way banking should be conducted. Too bad not everyone follows the rules. 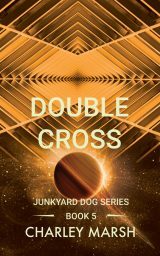 Double Cross takes Rita and her friends deep into the strange heart of ZetiTau banking where few have ventured before. Kwaku. Home of the mysterious Spider Woman. Spider silk. Lighter than air. Indestructible. No wonder Rita King wears spider silk skinsuits and wants them for her crew. To get them Rita must give in to the Spider Woman’s unusual demand. Kwaku. Home to the giant silk spiders. Never before visited by an outsider. Why the invite now? 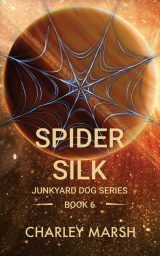 Spider Silk, Book Six of the Junkyard Dog series, takes Rita King and her companions into the bizarre and deadly world of spider silk. Once a galaxy cop who believed in the black and white of the law, Margarita King finds herself on a mission that straddles the line. 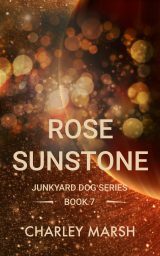 As the Junkyard Dog carries Rita and her crew to the only known source for a powerful crystal known as the Rose Sunstone, she wonders if the end justifies the means. Should Rita risk everything–including the freedom of her crew—for a friend? They soon learn that not only galaxy law protects the rare crystal. Join Margarita and the crew of the Junkyard Dog as they tackle a deadly task in the tale of the Rose Sunstone. Danger lurks everywhere in the galaxy. Margarita King, owner and commander of the Junkyard Dog, decides to visit New Earth to give her friends some much needed rest and relaxation. New Earth: fashioned after the great amusement parks on Old Earth. Visitors from all across the galaxy come for the amazing rides and to test themselves at the games of skill. Prime marks for the gang of abandoned children with nowhere to go and only one way to survive. 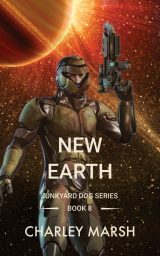 Book eight of the Junkyard Dog series, New Earth takes the reader on a wild and unexpected ride beneath the glitter of the galaxy’s greatest amusement park. The galaxy holds many strange and wonderful things . 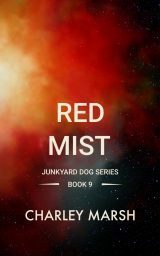 . .
Alone at the helm of the Junkyard Dog, pilot Margarita King notices a dense cloud of red dust approaching her ship. A strange anomaly of space never before recorded. Before Rita can react, an unseen force takes control of her body. Pressing in on her until she winks out of existence. Join the crew of the Junkyard Dog as they embark on their strangest adventure yet—one that will change their lives forever. When Margarita King and the crew of the Junkyard Dog exit a jump they nearly collide with a massive object. An object that shouldn’t exist. Even the best laid plans rarely work out as intended. 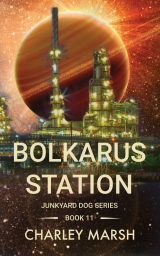 Join Rita’s crew on another strange adventure in the eleventh book of the Junkyard Dog series as they dig into the hidden world of a galactic refinery and the secrets it holds. 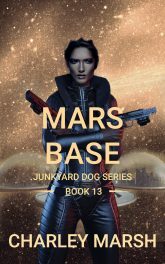 Mars Base, the final novella in the Junkyard Dog series, ends where Rita’s strange and unexpected journey began–with one big difference. You’ll have to read Mars Base to find out how it all ends! Get the first three novellas of the Junkyard Dog series in one collection. See individual book descriptions above.